Introduced the Eco locomotive, a new class of recycled locomotives equipped with new low-emission engines that reduce NOx and particulate matter. Rolled out the “Sleeper,” a custom engine-heating system that eliminates unnecessary locomotive idling in rail yards in winter months. Expanded a rebuild program to create engineless locomotives that provide emissions-free pulling power when coupled with a diesel locomotive. Reached 80 percent of GHG-reduction goal. Produced 1.9 percent fewer GHG emissions from business operations versus 2014. Achieved 7 percent reduction in nonlocomotive Scope 1 emissions. 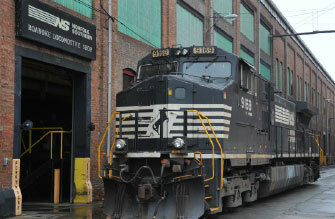 Locomotives in revenue service moved a ton of freight an average of 410 miles on a gallon of diesel. 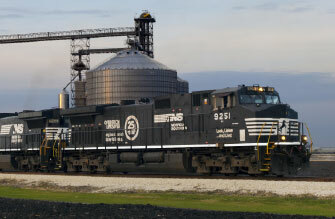 Locomotives in all work activities consumed an average of 1.28 gallons per 1,000 gross ton-miles. 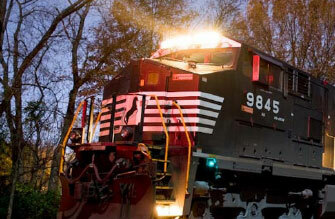 Set a 2020 locomotive fuel-efficiency goal to reduce fuel consumption by $80 million. 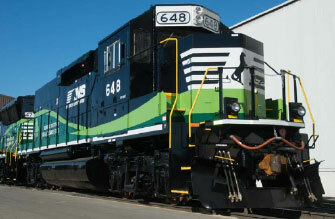 Since 2011, improved locomotive fuel efficiency by 3 percent per 1,000 gross ton-miles. Completed a five-year, $5.6 million environmental partnership in the Mississippi Delta to reforest 10,000 acres of former woodlands with 6.04 million trees. 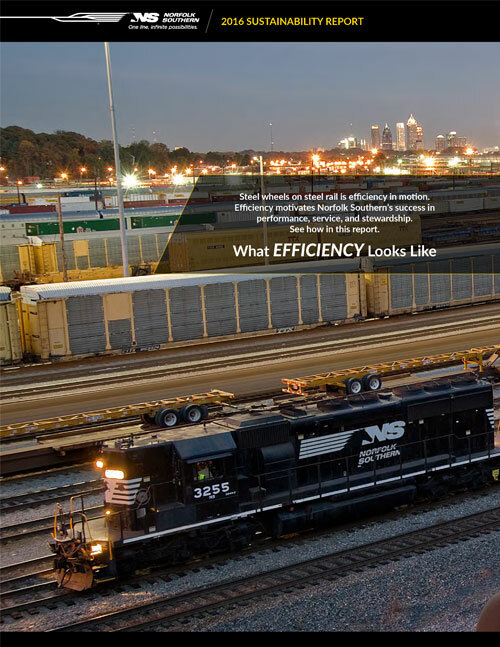 The trees eventually will generate carbon credits equal to nearly 20 percent of Norfolk Southern’s annual GHG emissions. Launched an initiative to restore 290 acres of historic wetlands in coastal South Carolina that will create wildlife habitat, restore natural water hydrology, and generate wetlands mitigation-bank credits that can be sold to support economic development. Generated 6 percent fewer emissions from purchased electricity sources. 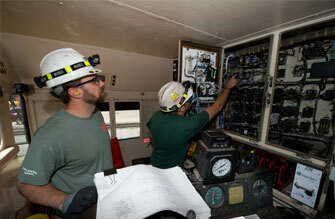 Completed lighting upgrade projects at 31 railroad facilities expected to generate annual energy and maintenance savings of $2.1 million and reduce annual CO₂ emissions by more than 9,500 metric tons. Generated $10.5 billion in railway operating revenues. Returned more than $700 million in dividends to shareholders. Helped locate 61 new and expand 32 existing industries in 20 states, representing $4.2 billion in industry investment, 6,000 customer jobs, and an estimated 88,974 additional carloads of business valued at more than $212 million. Generated an employee payroll of more than $2.3 billion and made purchases and tax payments totaling more than $6.3 billion across its 22-state operating territory. Announced a five-year strategic plan setting 2020 goals focused on achieving operating efficiencies, cost savings, and revenue growth. 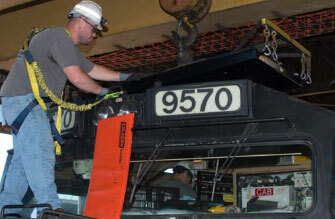 Improved composite customer service performance by 3 percent, including on-schedule delivery. 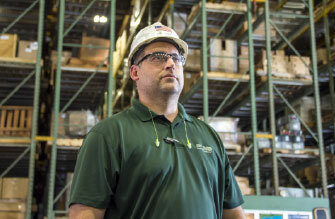 Invested $2.4 billion in capital projects to enhance customer service and grow the business. Purchased $4.2 billion in supplies and equipment, generating income for more than 6,700 supplier businesses. Increased purchases from minority- and women-owned business suppliers by 7 percent. $13.7 million in combined Norfolk Southern Foundation, corporate, and business giving to support human service needs, arts and culture, environment, and education in communities served by the railroad. Recorded a 13 percent decline in reportable employee injuries. Introduced new risk-factor safety training program for workforce. Launched telematics pilot to enhance vehicle fleet safety. 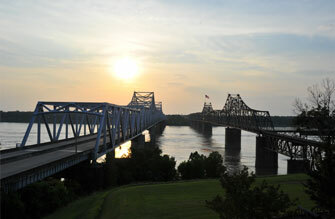 Created a new employee safety message, "i am Coming Home," to personalize safety. Established employee Diversity and Inclusion Councils in each of NS’ 10 operating divisions. Hired record numbers of female management trainees and conductor trainees. Recruited military veterans, who comprised 15 percent of all new hires. 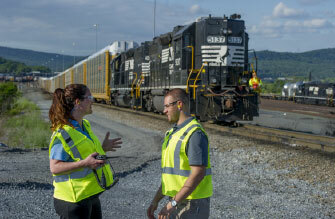 Achieved wellness milestone, with employees taking more than 19 billion steps – equal to 497 trips over NS’ 20,000 miles of rail – as part of the company’s health and wellness program. Recorded more than 2,500 hours of community service through the company’s formal Thoroughbred Volunteers program. 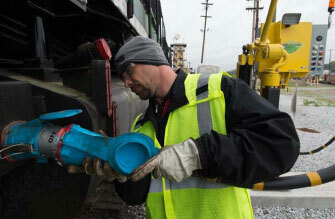 Helped train nearly 4,800 local emergency responders in 18 states in safe response to potential incidents involving transport of commercial freight regulated as hazardous material. 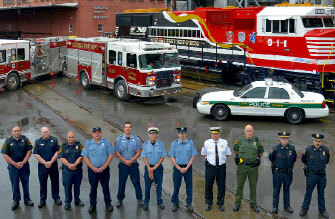 Sponsored training for 80 first responders on safe response to potential crude-by-rail incidents – part of a three-year rail industry effort in which NS so far has invested $800,000 in training nearly 220 emergency responders who live and work in communities where crude trains operate. 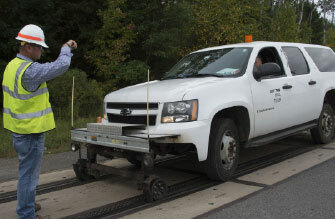 Raised public awareness about highway-rail grade crossing safety and the dangers of trespassing on railroad property, including Whistle Stop train tours in Ohio and the Carolinas, and a Train Your Brain campaign in Georgia.